This news article appeared on November 29, 2018, from Florida State University News (news.fsu.edu) and was printed with written permission from Amy Farnum-Patronis, Assistant Director for the Office of Communications for Florida State University. The article features Mark Hillis (Gamma Rho/Florida State 1964), Secretary of The Foundation Chapter Board of Directors. 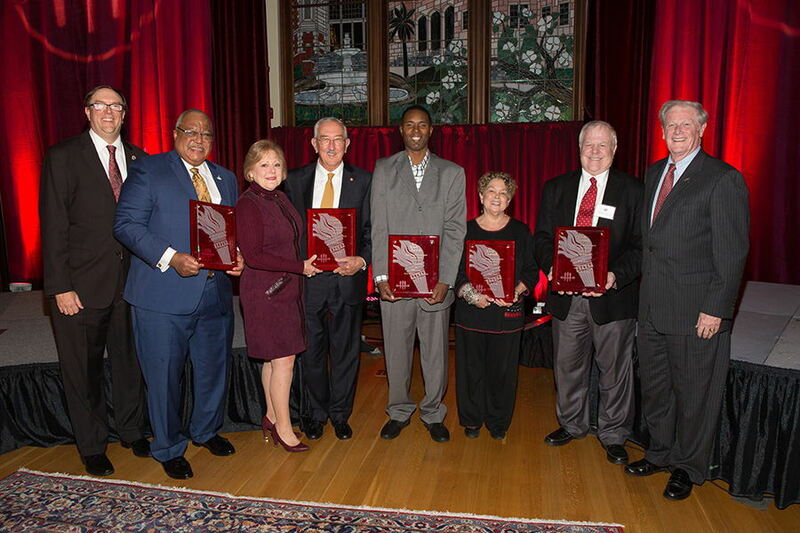 The Florida State University Faculty Senate honored six members of the university family with Torch Awards, an annual recognition of those who have contributed to the university’s academic excellence. The awards were presented Wednesday, Nov. 28, during a reception and dinner. Named for the trio of torches depicted in the university’s seal, the three categories of Torch Awards are: Vires, symbolizing moral, physical and intellectual strength; Artes, symbolizing an appreciation of aesthetics and the beauty of intellectual pursuits; and Mores, symbolizing respect for customs, character and tradition. This year, there were two Vires, two Artes and one Mores awards conferred. Melvin T. Stith (Vires), former professor and dean of the College of Business, received the Vires Award for his transformational leadership and ability to advance academic programs by building friendships. Stith served as a Jim Moran Professor of Business Administration and chair of the Department of Marketing before being named dean of the College of Business in 1991. He served as dean until 2004, spearheading the Jim Moran Institute for Global Entrepreneurship and the Entrepreneurship Bootcamp for Veterans with Disabilities program in the college. During his tenure, Stith played an integral role in courting some of the university’s top donors as well as enriching the business program by bringing alumni back to campus. He currently is serving as interim president of Norfolk State University in Virginia. Charlie Ward (Vires), alumnus and quarterback of the 1993 National Championship football team, received the Vires Award for his sustained embodiment of the principles of integrity, hard work and concern for others. Ward, a two-sport star athlete, won the 1993 Heisman Trophy, only months after leading the FSU men’s basketball team to the NCAA Elite Eight. Throughout his athletics career, Ward maintained a strong academic record and served as Student Government Association Vice President in his senior year. He went on to play 11 seasons in the NBA, mainly for the New York Knicks, before retiring from professional basketball in 2005. He has guided countless young people through his work as a high school football and basketball coach, and now serves head boys’ basketball coach at Florida State University Schools. Over the past 25 years, Ward and his wife, Tonja, have quietly and consistently donated to youth development organizations, charities, churches and schools. In 2015, they founded the Charlie Ward Family Foundation with the mission of supporting youth development programs and organizations and sharing Ward’s inspirational message of embracing the process that leads to success. Don B. Gibson (Artes), alumnus, former dean of the College of Music and respected music theorist, received the Artes Award for his tremendous contributions to FSU’s nationally recognized music programs. Gibson, who earned his doctorate at FSU in 1983, returned to his alma mater in 2006 to serve as dean and professor until his retirement in 2013. During that time, he spearheaded the renovation of the Ruby Diamond Concert Hall, helped transform a drab classroom into the new Longmire Recital Hall and expanded the college’s degree offerings. As dean, he always maintained an open-door policy for faculty and students and cultivated relationships by creating an annual luncheon where the college’s largest donors could interact with students and faculty they supported. In 2010, Gibson served as president of the National Association of Schools of Music, the nation’s oldest and largest accrediting agency for the arts. Gibson and his wife, Kyung-Ae, are generous donors to the college, and in his retirement, he continues to devote his time to the university, including chairing a 21-member search committee for provost in 2015. Barry M. Jenkins (Artes), Academy Award-winning filmmaker and alumnus of the College of Motion Picture Arts, received the Artes Award for his contributions to the art of filmmaking and his ambassadorship of Florida State University. Jenkins, who graduated from FSU with a Bachelor of Fine Arts in 2003, burst into the national spotlight after directing “Moonlight,” which won Oscars for Best Picture and Best Adapted Screenplay in 2017. His current film, “If Beale Street Could Talk,” won the Peoples’ Choice Award at the Toronto Film Festival in September and will be released nationally Dec. 14. Currently, Jenkins is transforming Colson Whitehead’s Pulitzer Prize-winning novel “The Underground Railroad” into a television series for Amazon. Jenkins has returned to FSU to share his films and experiences with current students and collaborates with fellow graduates on his films. He champions his alma mater in award acceptance speeches and media interviews, and he often describes how his experience at Florida State changed his life. 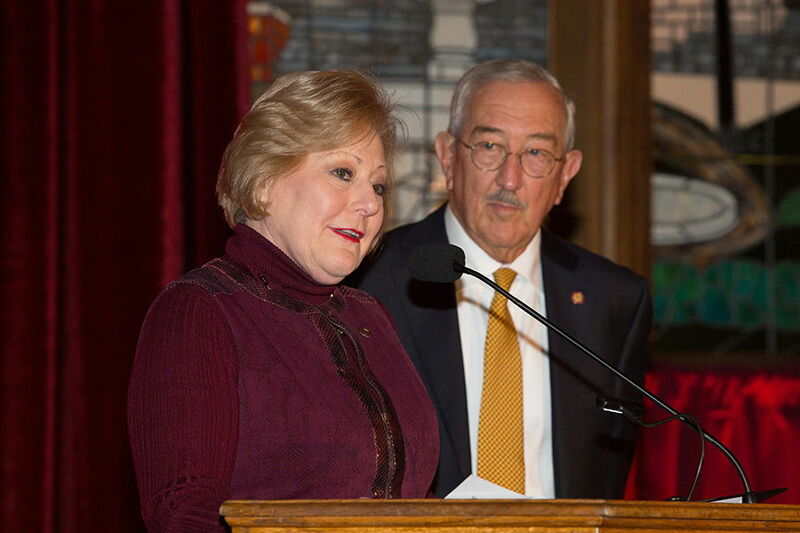 Mark and Nan Hillis (Mores), College of Business alumni and longtime supporters of FSU, received the Mores Award in recognition of their commitment of time, talent and financial support to the university. Mark and Nan Hillis are both inductees of the FSU Alumni Association Circle of Gold and the College of Business Hall of Fame. Together, they have made generous financial gifts touching areas across the university, including the College of Business, Athletics, Undergraduate Research and the FSU Alumni Association. Mark Hillis is vice chair of the FSU Board of Trustees and serves as chair of the board’s Academic Affairs Committee. He has been involved with many boards and committees at Florida State, including the FSU Foundation Board of Trustees and the Alumni Association’s national Board of Directors. A member of the Theta Chi fraternity as a student, Mark currently serves nationally on the Foundation Chapter of Theta Chi Inc.
Nan Hillis is a current member of the FSU Foundation Board of Trustees, where she serves on the executive committee as secretary. She also represents the Foundation as an ex-officio member of the Seminole Boosters Board. Nan also served as a member and former chair of the FSU College of Business Board of Governors. She is a lifetime member of the Delta Delta Delta sorority and serves as an adviser to the FSU chapter. The Torch Awards were established in 1996 to allow FSU faculty members to honor friends of the university who have contributed significantly to its ability to realize its academic mission. Faculty members make nominations to an awards committee that in turn makes recommendations to the Faculty Senate Steering Committee for approval. You may view the original article by clicking here.